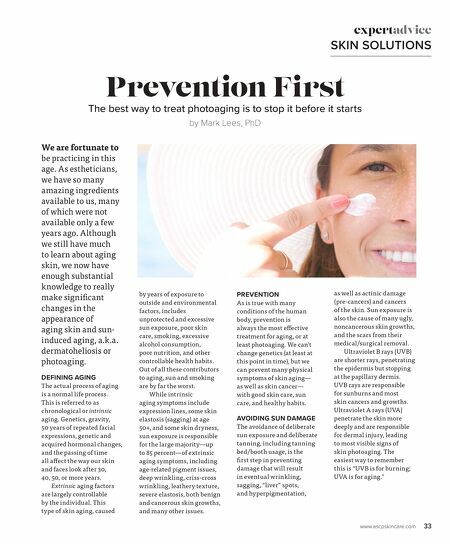 www.ascpskincare.com 33 Prevention First The best way to treat photoaging is to stop it before it starts by Mark Lees, PhD expertadvice SKIN SOLUTIONS We are fortunate to be practicing in this age. 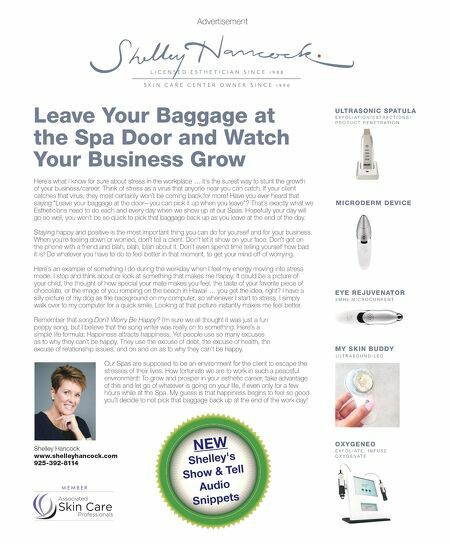 As estheticians, we have so many amazing ingredients available to us, many of which were not available only a few years ago. Although we still have much to learn about aging skin, we now have enough substantial knowledge to really make significant changes in the appearance of aging skin and sun- induced aging, a.k.a. dermatoheliosis or photoaging. DEFINING AGING The actual process of aging is a normal life process. This is referred to as chronological or intrinsic aging. Genetics, gravity, 50 years of repeated facial expressions, genetic and acquired hormonal changes, and the passing of time all affect the way our skin and faces look after 30, 40, 50, or more years. Extrinsic aging factors are largely controllable by the individual. This type of skin aging, caused by years of exposure to outside and environmental factors, includes unprotected and excessive sun exposure, poor skin care, smoking, excessive alcohol consumption, poor nutrition, and other controllable health habits. Out of all these contributors to aging, sun and smoking are by far the worst. While intrinsic aging symptoms include expression lines, some skin elastosis (sagging) at age 50+, and some skin dryness, sun exposure is responsible for the large majority—up to 85 percent—of extrinsic aging symptoms, including age-related pigment issues, deep wrinkling, criss-cross wrinkling, leathery texture, severe elastosis, both benign and cancerous skin growths, and many other issues. PREVENTION As is true with many conditions of the human body, prevention is always the most effective treatment for aging, or at least photoaging. We can't change genetics (at least at this point in time), but we can prevent many physical symptoms of skin aging— as well as skin cancer— with good skin care, sun care, and healthy habits. AVOIDING SUN DAMAGE The avoidance of deliberate sun exposure and deliberate tanning, including tanning bed/booth usage, is the first step in preventing damage that will result in eventual wrinkling, sagging, "liver" spots, and hyperpigmentation, as well as actinic damage (pre-cancers) and cancers of the skin. Sun exposure is also the cause of many ugly, noncancerous skin growths, and the scars from their medical/surgical removal. Ultraviolet B rays (UVB) are shorter rays, penetrating the epidermis but stopping at the papillary dermis. UVB rays are responsible for sunburns and most skin cancers and growths. Ultraviolet A rays (UVA) penetrate the skin more deeply and are responsible for dermal injury, leading to most visible signs of skin photoaging. The easiest way to remember this is "UVB is for burning; UVA is for aging."